Exporting allows you to make backups of projects and settings and share projects with friends who have Web Image Collector. You can export files from the Workbench in several ways, depending on the export wizard that you select. On the main menu bar, click File - New Project. The New Project wizard opens. When a project is closed, it can no longer be changed in the Workbench and its resources no longer appear in the Workbench, but they do still reside on the local file system. Closed projects require less memory. When a project is deleted from the workspace, you have the choice to remove it from the workspace only or to also remove the files from the filesystem. 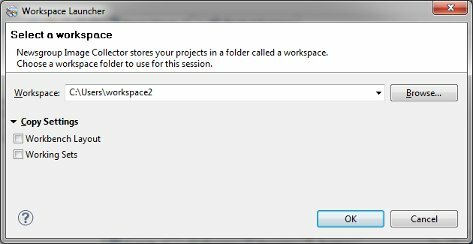 By removing from the workspace only, you will keep the project files on your computer but the project will not be visible in the Project Explorer view. When a project is removed from the workspace but not from the filesystem it can be added back to the workspace using the import Existing projects into the Workspace importer in the File menu. Importing allows you to restore backups of projects and settings and share projects with friends who have Newsgroup Image Collector. You can import files into the Workbench in several ways, depending on the import wizard that you select. The recommended way to restore project backups created with the export wizard is to use the Existing projects into Workspace wizard. This wizard will import projects from a folder on the file system or projects stored in an archive file. This wizard is the recommended way to restore project backups created with the Archvie file and File system export wizards. To restore projects from a directory, select a folder which contains projects that were exported or previously existed in another workspace. To restore projects from an archive file, select an archive file that was created using the Archive file exporter. File directories and archive files may contain more than one project, and they will appear in the project list. Select the project(s) to import and click finish. This wizard will import archive files created with the Archive file export wizard or a manually created zip or tar file. The files in the archive will be imported into an existing project at the project root folder level. This importer is ideal for adding new files into an existing project. This is not the recommended	way to restore project backups created with the Archive file export wizard. To restore exported projects, use the Existing Projects into Workspace wizard. This wizard will import files created with the File system export wizard or a manually created files and folders. The files in the directory will be imported into an existing project at the project root folder level. This importer is ideal for adding new files into an existing project. This is not the recommended	way to restore project backups created with the File system export wizard. To restore exported projects, use the Existing Projects into Workspace wizard. Importing preferences will restore backups of the global application settings under the Window - Preferences section. The Project XML Importer will import one or more projects that were exported using the Project XML Exporter. You can import from an XML file located on your computer's filesystem or from the web at a specified URL. 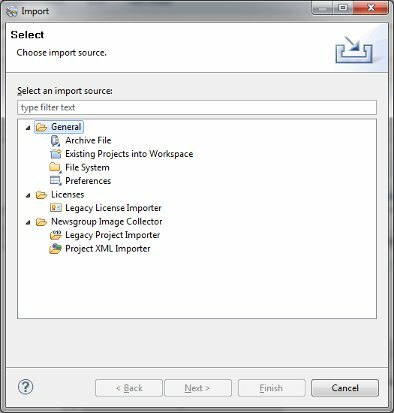 The legacy project XML importer will import projects created with the 2.x version of Newsgroup Image Collector. This importer should be used if you have upgraded from the 2.x version and you have projectes that you would like to import into the new product. 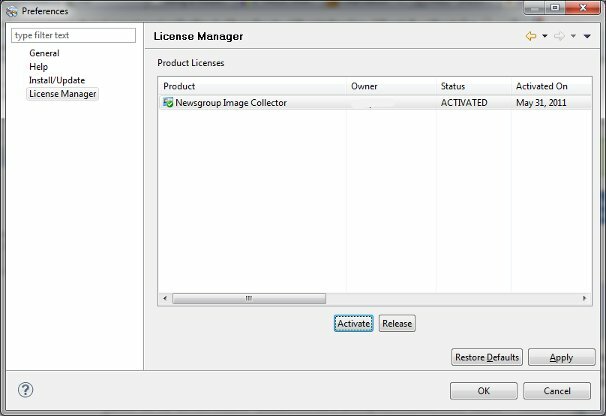 The legacy license importer will import a product license created with the 2.x version of Newsgroup Image Collector. 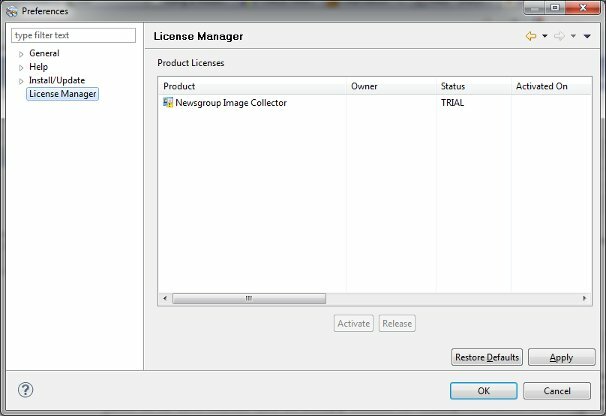 If you have purchased a license for the 2.x version of Newsgroup Image Collector, you can use this importer to add your paid license to the new product. Exporting an archive file will bundle together all files and settings of one or more projects into a single zip or tar file. You can then use the zip file to send to friends or save to another location as a backup. The Export archive file wizard by default will include all files in the project. The wizard gives you the ability to filter out unwanted files and folders. Exporting a file system will make a copy of an existing project to a new location. All project files and folders will be duplicated and saved to the specified directory. The wizard also gives you the ability to filter out unwanted files and folders. Exporting preferences will make a backup of the global application settings under the Window - Preferences section. Not all preferences can be exported and therefore the list may be empty. As more features and plugins are added to the product, new preferences may appear which are available for exporting. 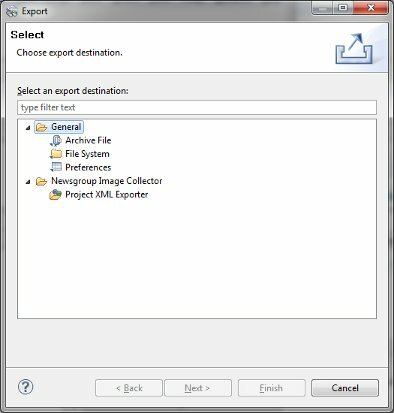 The Project XML Exporter will create a single XML file with the settings for the selected project or projects. This exporter gives you the ability to backup the project settings without including the downloaded image files. You can then share this XML file with friends so they can download the same images. This product provides facilities for adding new software to the platform or updating software in the system. Click Help - Check for Updates. This will contact the Web sites defined in your Available Software Sites preferences to look for upgrades. If upgrades are available, they will be presented in the Available Updates wizard. To check for updates for only certain items in your installation, use the Installed Software page to select the items you are interested in and check for updates. Click Help - About and then click Installation Details... to open a dialog showing pages that provide more detail about your installation. Select the items that you wish to update. Click Update.... This will contact the Web sites defined in your Available Software Sites preferences to look for upgrades. If upgrades are available, they will be presented in the Available Updates wizard. Click Help - Install New Software.... This wizard shows you the items that are available for installation. Using the Work With combo box, you can select a site to browse its contents, or you can choose to browse software from all sites. Browsing all sites is useful when you know the name of something but do not know where it is located. The filter box can be used to type part of the name of something that you are looking for. The list of items will be filtered to only those matching the text that you type. A checkbox at the bottom of the page can be used to control whether the items should be grouped in categories, or listed by name. A checkbox at the bottom of the page can be used to control whether all versions, or only the latest versions, of software are shown in the list. A checkbox at the bottom of the page can be used to control whether items that are already installed should be shown in the list. As you browse the available software, you can check the items that you wish to install. When you have finished making your selections, click Next to install the checked items. If the items you are installing require other software items in order to operate, those requirements will be included in your request. A checkbox at the bottom of this page controls whether all software sites will contacted when looking for requirements, or only the site shown in the Work With combo box. Once you click Next, the wizard will validate your selections against your installed software, and report any configuration problems that might prevent you from installing a particular software item. If there are conflicts that prevent you from installing one or more of your selections, the problems will be reported in the details area at the bottom of the wizard. You may uncheck one or more of the selected items and validate the install by clicking Next again. Or, you may click Back to return to the first page and change your selections. If all of the requirements are available and there are no other installation conflicts, clicking Next will show the Install Details page. The items to be installed will be listed. Expanding each item will show what additional items will be required to complete the install. You will see an estimated size of the installation at the bottom of the page. If the selected items have license agreements to be reviewed, you must click Next. Carefully review the license agreements for the items you wish to install. You may also notice items in the license list that you did not choose for install, but that are required by the the items that you are installing. If the terms of all these licenses are acceptable, check "I accept the terms in the license agreements." Do not proceed to download the features if the license terms are not acceptable. If the license agreements are acceptable, or if the selected items did not have license agreements to review, click Finish. This will begin the download and installation of the new software. Warning: Because of the possibility of harmful or even malicious software, you should only download software from parties that you trust. Once all of the software is downloaded successfully and the necessary files installed into the product on the local computer, you will be prompted to restart for the Workbench. Click Yes when asked to exit and restart the Workbench for the changes to take effect. Add a new site using the Install/Update - Available Software Sites preference page. Open the Install/Update - Available Software Sites preference page to see the list of sites that are used to gather the available software and search for updates. Click Export... to save the list of sites to a file. This is useful for sharing site lists with other users or across multiple installations. If search only is selected, a popup will appear notifying you that updates have been found, and an updates icon will appear in the status bar. You may click on the popup to review the list of updates. The same Available Updates wizard is used when you search for updates manually using Help - Check for Updates. If the second option has been selected (download updates automatically), the search will be scheduled as before, but when new updates are found, the download will commence immediately. When all the features have been successfully downloaded, a popup will appear notifying you that updates have been found and downloaded, and an updates icon will appear in the status bar. You may click on the popup to review the list of updates. The same Available Updates wizard is used when you search for updates manually using Help - Check for Updates. Newsgroup Image Collector is a fully featured product limited to a 15 day trial. If you decide that you like NIC and want to use it beyond the trial period, you must activate your copy of NIC. To activate NIC, you must first purchase a product license. 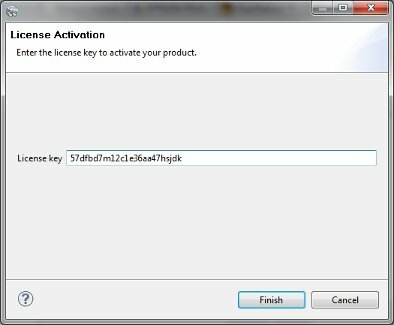 After you purchase a license, you will receive a license key. Simply copy and paste this key into the activation area of NIC to complete the activation. At this page you will enter the number of licenses you want to purchase. A license is limited to one computer and one user account on the computer. If you plan to use NIC on more that one computer, you will need to purchase a license for each computer. Similarly, if you have multiple user accounts on your computer and you want to use NIC on more than one user account, you will need to purchase a license for each user account. After you specify the number of licenses to purchase, you will see the results in a shopping cart with options to edit your cart. If you are ready to purchase the items in your cart, click continue. At this point, you will need to login or create a new account at our website. Following this, you will be presented with payment options such as credit card and paypal. After your payment is processed, you will see your license key on the web page. You will also receive an email containing your license key and invoice details. Select and copy the license key so that you can paste the text of the key into NIC. Start NIC and select Windows - Preferences from the menu. You will then see the Preferences dialog, then click on License Manager on the left. Select the Newsgroup Image Collector license in the table and then click Activate. You will now see the license activation wizard. Paste in your product license key and click next. You will now see the final page with a status bar. NIC will connect to our license server and verify your license key. When this is completed, you will have an activated full version of Newsgroup Image Collector. The current workspace can be switched by using the File - Switch Workspace command. If you have already switched your workspace previously the previous workspaces will be available for selection in the Switch Workspace menu. The Switch Workspace -- Other.. menu item will open the switch workspace dialog. The dialog will allow you to browse for or manually enter a new workspace location. The combo will also allow you to select your previously selected workspaces. When you switch your workspace you can select settings than will be transferred to the new workspace.